Each month, our Stillwater LCFS Monthly Newsletter takes an in-depth look at one aspect of California’s Low Carbon Fuel Standard and other low carbon standard efforts around the country. In our latest LCFS Monthly Newsletter, Jim Mladenik compares the first quarter of Oregon’s Clean Fuels Program with California’s LCFS first quarter. The following is an excerpt from the latest Stillwater Monthly LCFS Newsletter Highlight. Oregon’s Department of Environmental Quality (DEQ) recently released the first quarterly data summary for its Clean Fuels Program (CFP). The CFP became effective as of January 1, 2016. In the first quarter, 159,000 MT of credits were generated versus 140,000 MT of deficits. This represents 13.5% over-compliance for industry as a whole. The following graph shows credits generated by fuel type. As you can see almost all of the credits were generated by ethanol and biodiesel. All of the other types of the alternate fuels (CNG, LNG, biogas, electricity, and renewable diesel) added together produce less than 1% of the credits. We think it will be interesting to compare and contrast the State of Oregon’s CFP first quarter with what happened in California’s first quarter of compliance back in 1Q 2011. 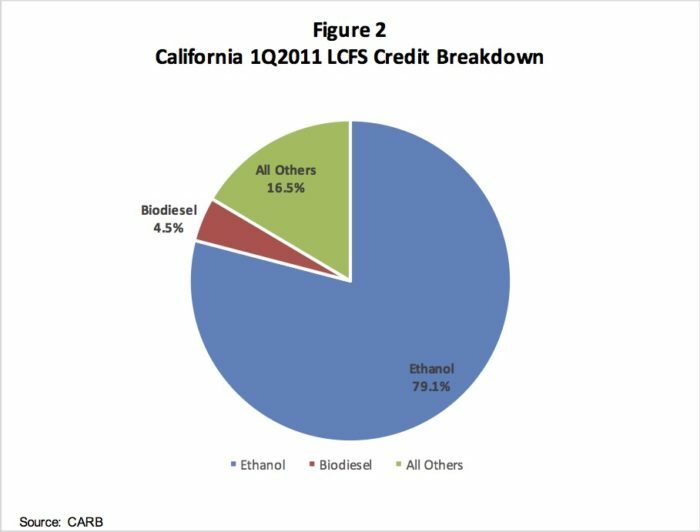 So let’s start by looking at the same breakdown for the first quarter of California’s LCFS compliance (1Q 2011). California had far fewer credits from biodiesel and much more from other types of alternate fuels. Why would this be? First, consider that very little can change in the first quarter of a program such as LCFS or CFP, especially since both California’s and Oregon’s LCFS programs were threatened with lawsuits and political maneuvers. So the state of the business in the first year of the program is very much what had existed prior to the program being adopted for each fuel. Prior to LCFS, California had already been aggressively pursuing multiple alternatives to petroleum fuels for over a decade through subsidies, regulations, and efforts to influence public opinion. In addition, CARB had discouraged biodiesel blending because of data that suggested biodiesel increases NOx emissions. So there was very little biodiesel in the pool in 2011 and many alternate fuels being used in different capacities. Contrast this with Oregon, which had 5% biodiesel blend requirement in diesel prior to implementing CFP, but very little resources to encourage other alternate fuels. 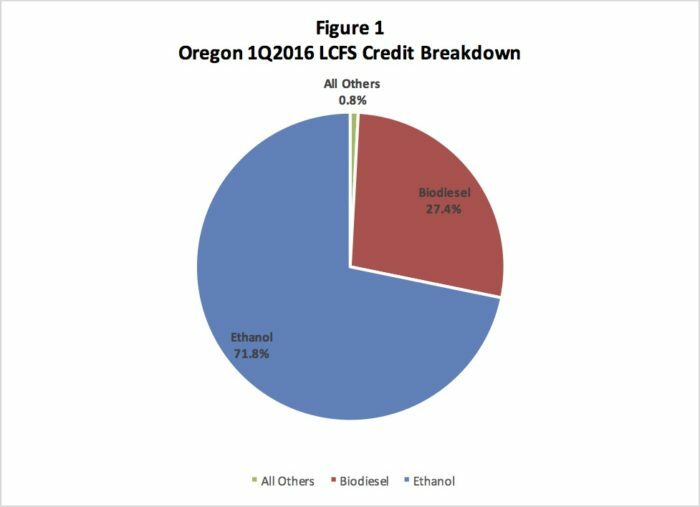 As expected, based on the structure of fuels markets in each state when LCFS and CFP was implemented, a much higher percentage of credits in Oregon are due to biodiesel than in California. California had much greater contributions from CNG and (less so) LNG, which are both due to long term, concerted efforts by the state to convert diesel vehicles in the port and city fleets to cleaner burning natural gas. Ethanol also supplied a larger contribution. In the entire fuel pool, California percent compliance for California’s LCFS was nearly double in the first quarter of operation as in Oregon. Obligated parties began generating excess credits needed for compliance later on in the program when the compliance obligation was increased. This has not been happening in Oregon, which when combined with competition for low carbon biofuels with California, might make compliance much more challenging in a couple of years. Interestingly, overall percent compliance in California in the first quarter of 2016 was about 107% with a 2% reduction requirement in carbon intensity. It was almost the same as that in Oregon which has a CI reduction requirement of 0.25% which is one eighth as great. Clearly competition between California and Oregon for the lowest carbon alternate fuels will be an ongoing issue to keep an eye on. Sign up for Stillwater’s LCFS Newsletter to read the entire analysis of Oregon’s CFP and California’s LCFS first quarters.